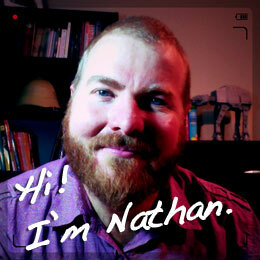 Nathan Russell is an award-winning game designer, fiction writer and prolific blogger. He teaches high school English and drama, is a freelance writer, blogs for brands and publishes his own games. He is currently working on a number of fiction and game design projects and blogging about travelling with autism at Autism Family Travel. He graduated from the University of Newcastle in 2003 with a triple major in Education, English and Drama. In 2005 he won the inaugral Ronnies for his satirical roleplaying game Space Rat: The Jack Cosmos Adventure Game. In the same year he founded Peril Planet Entertainment, which has since published more than a dozen games. His has written for White Dwarf, Fenix and Bully Pulpit Games, among others. Nathan created and co-hosted the popular tabletop gaming podcast Here Be Gamers! from 2008 – 2012. In 2009 he co-founded The Stockade Project to support the burgeoning Australian independent game design community and in 2010 he established National Game Design Month, an international event for game designers. He wrote his first “proper” story at the age of 10, a piece of Robotech fan fiction that has since disappeared into the ether. His first magazine article was published in White Dwarf magazine in 1999. He has been a door-to-door salesman, worked for an international games company, built fences and literally dug ditches for a living. He currently teaches high school English and Drama. Nathan lives in Newcastle, Australia, with his wife Kirsty, their three children and two pugs. He likes flying, dislikes swimming and hopes to one day own a robotic pet – preferably one that cleans up after itself. When asked the eternal question, “Ninja, Pirate, Robot or Zombie?” he is inclined to answer “Space Cowboy”.